To the players, management and supporters of Offaly may we firstly extend a warm welcome to Ballycastle and Páirc MacUílín ahead of your visit for the National Hurling League. 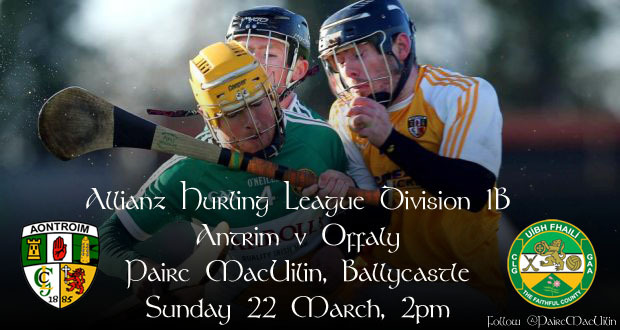 Offaly are familiar with the surroundings in Ballycastle having played here twice in 2014 in last year’s Allianz Hurling League and the first round of the All-Ireland SHC Qualifiers. You will then be traveling on a single carriage way for 4 miles and then take a right at the sign post for Ballycastle/Rathlin Island Ferry. Pairc MacUilin is located on the Whitepark Road. If using a Sat Nav please ensure that you use the Postcode BT54 6HA. Parking is available within the grounds and our stewards will be on hand to assist you. Refreshments will be available inside the ground. Please note there are NO cash machines on-site, however there are four located in the town centre. You can also follow @McQuillanGAC and @PaircMacUilin on Twitter.